This is dear little Yushi. Nicknames: Yush, Oozie, Uzi 9mm, Nines, Stupid. Yushi was my husbands and my first kitty together. My mum found her as an abandonded kitten at the local shops the same week I met my future husband. Sadly we no longer have Yushi, but we had 13 very happy years with her. We believe she was a Russian Blue breed. Grey with silver tipped fur. But she clearly wasn't the best in the litter as she had short, stumpy legs. How anyone could loose or dump her and not look for her is beyond me. And my mani inspired by Yush. Base was a franked metallic silver that I added black polish to get a dark grey metallic. I then sponged Sally Hansen Celeb City on the tips. I decided that the colour difference between the two polishes wasn't enough, so I sponged a little black onto the back of the nail. 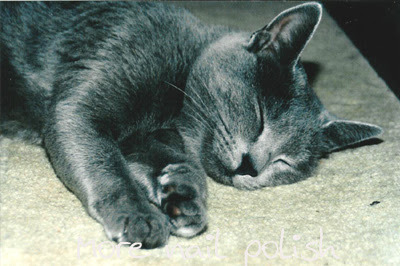 This mani represents her grey, silver tipped fur. Miss you oozie. That's so sweet, such a gorgeous little girl :) Love the mani lots too! I saw a polish on a blog the other day that reminded me of my first pony. Sadly it's retired but when I finally decide to brave ebay i'll get it! 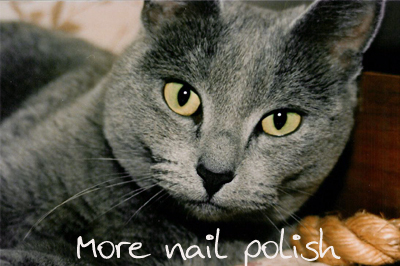 love your mani inspired by your cute kitty! Thank you all so much for your lovely comments about my beautiful kitty (and pretty mani)!! PerdyClaws - I love finding other polish lovers that are a cat crazy too. We have 6 atm. So more kitty kreations to come.